As we recently reported on our Boston Personal Injury Attorney Blog, there are about 250 home fires reported every year that are started because Christmas tree fires. These fiery accidents kill nearly 15 people, injure another 30 and cost nearly $20 million in property damage annually. A majority of holiday-related accidents are in fact preventable. Residents are urged to be smart with their decorating this year. Fires may not be the only dangers lurking in the holiday season. According to The Washington Post, the number of holiday accidents and injuries in Massachusetts and elsewhere involving decorating for Christmas is on the rise. Many of the reported incidents involve lacerations from broken Christmas tree ornaments and falls from ladders used to put up Christmas lights. Just like any other chore that needs to be done around the house, Christmas decorating should be no different. Be prepared, have a plan and keep safety as a number one priority. Our Boston personal injury attorneys understand that officials estimate that nearly 15,000 people made a trip to the emergency room during November and December of last year. That number is up from 2007 (with an estimated 10,000) and up from 2008 and 2009 (both with an estimated 12,000). 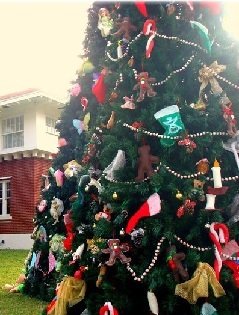 Residents are urged to be cautious when decorating the house this year and when setting up Christmas trees. Many holiday-related accidents can be prevented with a little planning. “A well-watered tree, carefully placed candles, and carefully checked holiday light sets will help prevent the joy of the holidays from turning into a trip to the emergency room or the loss of your home,” said Commission Chairman Inez Tenenbaum. According to the National Fire Protection Association in Quincy, Massachusetts, fire departments respond to hundreds of Christmas tree fires every year. These tree fires are caused by residents placing trees too close to heat sources, by electrical fires and by failing to turn off a tree when leaving the house or going to sleep for the night. Residents are also urged to be cautious when lighting candles during the holiday season. Never place them near flammable objects and remember to blow them out before leaving the house or going to bed. Never leave a lit candle unattended. Candles are the cause of hundreds on home fires every year. Another quick tip offered from fire departments across the nation is to never burn wrapping paper in a fireplace. This type of paper can cause a flash fire that can get out of control quickly. Be cautious when putting up your holiday decorations. A majority of these holiday-related accidents happen within the 12 days surrounding Christmas. Please exercise extreme cautious to achieve the cozy, festive and safe holiday feel. We want to wish everyone a safe and happy holiday season. If you or a loved one has been involved in an accident in the Greater Boston area, contact the personal injury lawyers at the Law Offices of Jeffrey S. Glassman, LLC for a free consultation to discuss your claim. Call 1-877-617-5333.